You have to hand it to French science fiction writer Jules Verne. More than a century after his death, he not only continues to be a best-selling author, his books still provide ripe material for movie adaptations. 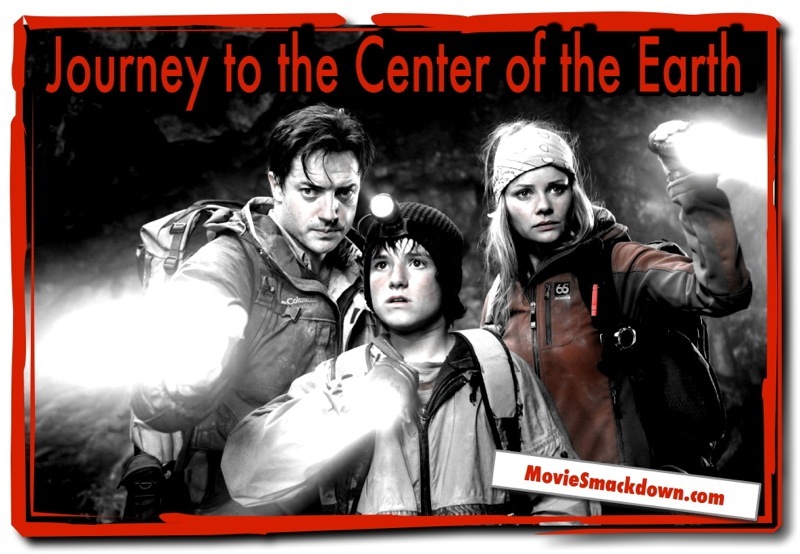 2008’s Journey to the Center of the Earth was a more or less straightforward adaptation of Verne’s adventure story aimed at kids, and while its similarly targeted sequel, Journey 2: The Mysterious Island, drifts a little from its origins, much of Verne’s content is used in the movie. 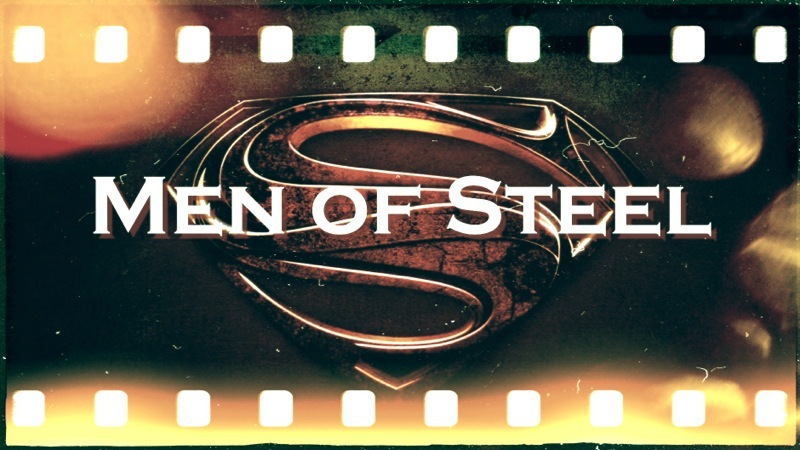 Essentially, both are old-fashioned, earnest, quest movies spiced up a bit with contemporary references for the target audience, with 3D added to give the kids some funky eye candy. So we’re doing a very Movie Smackdown thing by pitting Verne against himself. 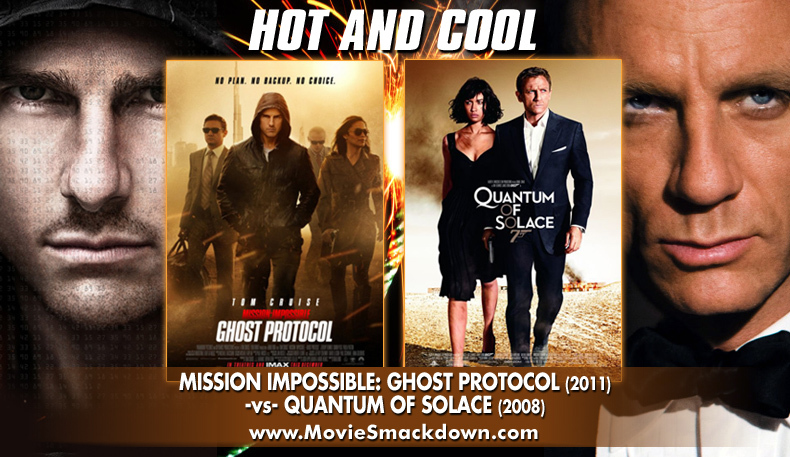 We know who the winning source material writer is going to be; the question is, which movie will find a Smackdown victory at the end of its quest? Headstrong adolescent Sean (Josh Hutcherson) is nearly arrested by the cops when he tries to escape from a satellite research center he’s broken into. Ah, teenagers. At home he’s chastised by his stepfather Hank (Dwayne Johnson), with whom he has a difficult relationship. Hank tries to get on the kid’s good side by engaging him in conversation… as in, What were you looking for at a secret government facility, anyway? The answer is a coded radio message directed at him that was too weak to pick up without the aid of the center’s equipment. This isn’t some half-cocked adolescent excuse — Sean’s long-lost grandfather Alexander, a noted adventurer, has been trying to get in touch. But what does the message say? Helpfully, Navy veteran Hank is a good code-breaker and the two nearly bond when they crack the message together. And what a message it is. Alexander has found the title geographic feature of a certain French author’s book, The Mysterious Island. The decoded message contains instructions on how to make a map with the exact coordinates for the island (a la Robert Louis Stevenson and Treasure Island). Instead of being a figment of Verne’s imagination, it seems the Isle Mysterious is a real place in the midst of the Pacific Ocean. As they must if we’re to have a movie, Hank and Sean figure the best course of action is to take a big trip in search of the island (it’s a good thing they don’t have work or school to get in the way). On their trip they pick up a father-daughter team of reluctant adventurers (Luis Guzman and Vanessa Hudgens), and the four soon find the island. It’s inhabited by tiny elephants and immense lizards, a classic switch that’s a nod to the work of Jonathan Swift. 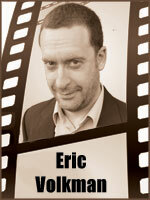 It’s also populated by a regular-sized Michael Caine playing Sean’s moderately strange but jolly adventurer granddad. The crew explores the island with Alexander guiding the way, but time is against them — the sea is quickly reclaiming the land mass, and Sean must figure out a way of escaping back to safety or they might drown before they see many of its sights. It’s a good thing, then, that Verne’s Nostromo submarine, of 20,000 Leagues Under the Sea fame, is anchored in a cave on the island’s coast. As in any adventure movie, it’s a race against time — sinking island vs. adventurers dashing to reach that submarine-hiding cave. …Except, of course, an annotated copy of you-know-who’s famous work — that’s right, Journey to the Center of the Earth. As evidenced by this movie and its sequel, the Anderson family has a habit of providing coded clues about lost worlds to each other. This particular world is accessible through a tube located in an extinct volcano in Iceland. As seems to be the rule in Verne movie adaptations, a young female sidekick, Hannah (Anita Briem), is found, and the three go traipsing around the interior of our planet. They’re not alone, of course, and the dinosaurs and ugly prehistoric fish who inhabit this dark world don’t seem to be too happy to have them as guests. The three realize the earth’s core is full of danger and soon hatch a plan to escape. The Nostromo is only available for the sequel, however, so Sean and company are forced to figure out a better way to vault themselves back up to the safety of the planet’s surface. Verne was such a clear-voiced, imaginative writer that it’s hard to go wrong adapting his stories. Both Journeys do good jobs of bringing his vision to life. Or, in the case of the second film, Verne’s and Swift’s and Stevenson’s and even Plato’s, whose famed lost city of Atlantis – sure, why not? – makes a prominent cameo appearance. The direction (by Eric Brevig in the root film and Brad Peyton in the sequel) is capable if unspectacular in both cases. The same can be said of the writing which, befitting two family films, involves Michael Weiss, with the husband-wife team, Jennifer Flackett & Mark Levin in Journey 1; and Richard Outten, with cousins Brian Gunn & Mark Gunn in the second outing. For the most part, the adapters do the smart thing by stepping aside to let the story and the visuals do the work. The big dinosaur in the first movie is pretty impressive, as is that long volcano tube-slide that shoots our heroes into the heart of our planet. Journey 2 has a slight edge in the visuals contest since it offers more variety with those cool little elephants, the ruins of Atlantis and plenty of action inside everyone’s favorite nineteenth century luxury submarine, the Nostromo. You don’t watch a Verne adaptation for the acting, which is good because in both movies most of the cast pretty much phones it in. Hutcherson is fine and energetic as the wide-eyed kid of Journey 1 and his surly teenage version in the sequel. Fraser is a goofier and more engaging adult lead than Johnson, but this is balanced by the always-charming presence of the reliable Caine as Sean’s explorer granddad. 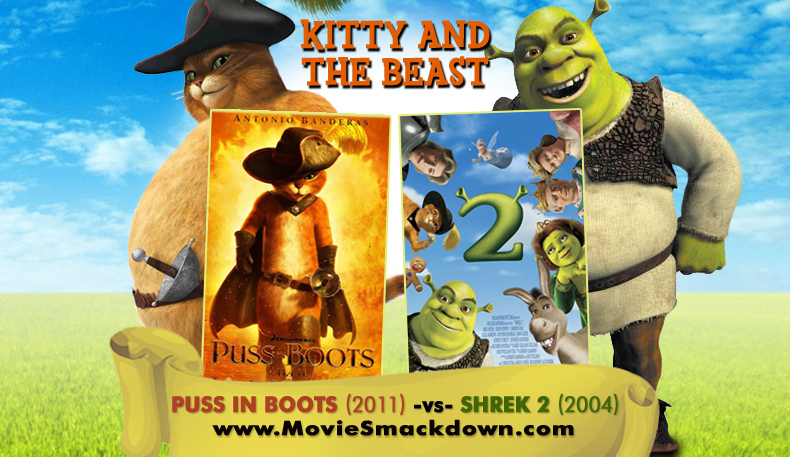 All in all, both films are fun, breezy, unchallenging pieces of work that do what they set out to do — provide ninety or so minutes of entertainment geared to the young. Adults will find them harmless and enjoyable too, if not particularly memorable. No group of Verne fans will ever reach a consensus on which book was the writer’s best. Some say Journey, others prefer 20,000 Leagues, some choose Around the World in 80 Days. Our little contest is much easier to pick. Do we want to spend time in the center of the earth or take a trip to that crazy chunk of land far out in the Pacific? The answer is the island. Its visuals are better and the variety wider. Come on, how can you choose against a movie that features both Atlantis and Captain Nemo’s famous submarine? 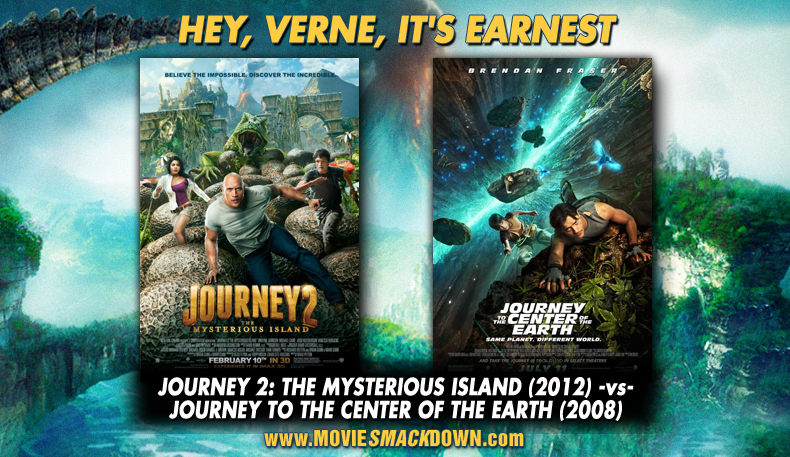 They make our winner, Journey 2: The Mysterious Island, worth exploring.